While it's tempting to open with a played out tagline, I'll resist and just pass along the extremely cool news that Ubisoft has officially unveiled Silent Hunter 5, the latest in its esteemed combat submarine simulation series. For the record, we've actually known about its existence for awhile now--in the case of "out of sight and mind" sub-sims, loose lips apparently don't sink ships--but this is the first official nod beyond some whispering on message boards. 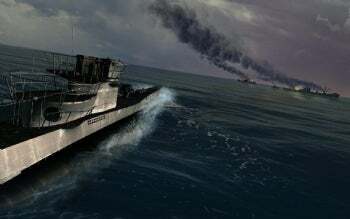 Not a lot of specifics yet, but aside from the fact that it's in the able hands of Ubisoft Romania and scheduled for "early 2010," the fifth in series will once more allow you to captain a German Unterseeboot and throw down with Allied forces across the Atlantic and Mediterranean. That in itself isn't a first for the series--you had control of a U-Boat in the second and third games as well as the expansion pack to the fourth--but if I know Ubisoft Romania, they'll be aiming to make it the most detailed iteration yet. While you could previously poke around the interior and exterior of the series' subs, Ubisoft claims SH5 will let you "live the life of a submarine captain from a first-person view and lead a crew in a critical campaign." 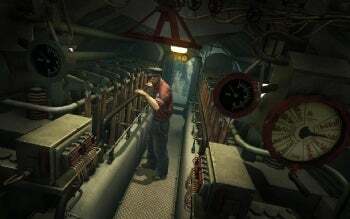 You'll also be able to interact with said crew more meaningfully, watching them go about their daily routines and experiencing "the tension and fear inside the U-boat" by way of an "advanced" order system. Umm, I'm not sure what that last part means exactly, unless Ubi's referring to the instance where the captain barks out "Äusserste Kraft!" ("full speed!") and the helmsman suddenly snaps, turns, and comes at him with a Ratschenmaulschlyssel ("open-ended ratchet wrench"). Which, of course, would be very advanced indeed. As I recall, the last two games had dynamic campaigns, but in SH5 you'll be able to choose your own targets and apparently alter your ability to interact with the geography (locational access, upgrades, resupply points) while inciting the Allied ships to re-plan accordingly. I gather this means we'll get to tangle with a more strategically aware and reactive AI than just another tactically-minded one. Sound a little intimidating? I'd say "good, that's the point," except for the part where I want there to be a Silent Hunter 6, so beginners, take note: They've retooled the interface and added a training-wheels mode that'll let you drop in straightaway and get just the tips of your toes wet. When that gets old, you can flip over to "expert mode" and plumb the effects of things like "neutral buoyancy," or how to stay "trim" using forward and aft tanks. It's true, as the press release claims, that Silent Hunter is the "most award-winning submarine series of all time." It's also true that it's virtually the only submarine series of all time. All the more reason to celebrate getting to number five, given how accomplished--if not exactly chart-busting--the last two-and-a-half games have been. Where to next? How about: The official website. What can we glean from the official trailer? That German U-Boat crews apparently spoke extremely good, unaccented englisch.